Contact us for up-to-date delivery estimate. L.R. Baggs has done it again! We've had longstanding confidence in the incredible line of high fidelity electronics these folks produce and now, with the release of this top-of-the-line PA system, we can safely say that, short of the guitar, mic, and performer, L.R. Baggs supplies everything you need for stellar live performance. We had a blast demoing this one (check out the video!) and all of us walked away thinking it met all of our needs, diverse as they are--solo guitarists, instrumental duos, and, of course, singer/songwriters aren't going to look back after the first gig with the Synapse! After decades of consistently raising the bar in acoustic amplification with the pickups and electronics we have become known for, we are naturally compelled to add another level of quality to your sound by completing the chain from input to output. Introducing The Synapse – Personal PA System, the result from nearly four years of our most advanced engineering to date. Developed primarily for the singer songwriter and solo acoustic performer, this revolutionary approach to the portable loudspeaker isn’t just visually unique, it will fill a room and impact your audience like no other speaker can. A radical departure from conventional loudspeakers and portable line array systems, the Synapse employs a unique, all-horn speaker design that projects a full 180 degree horizontal waveform at all frequencies, connecting both you and your audience together in the exact same sound. We’ve also eliminated the disconnect inherent in two way systems with a groundbreaking compression woofer that propagates sound in the same fashion as the high frequency driver, seamlessly blending the two as if they were one cohesive source for uniformity across all frequencies. The combination of compression, the ease and intimacy created by the horns, and the ultra-wide dispersion fills the room with a dynamically rich, natural sound. The electronics feature two channels of all-discrete preamplifiers with independent gain controls, 3-band EQ, and a custom voiced reverb. The circuit is composed of carefully selected, top-shelf components chosen to retain the purity of the signal and deliver studio quality sound for live performance. The 500 watt, Class-D power amplifier is compact and lightweight, with more than enough power to propel the drivers loudly and efficiently. After an in depth blind audition of more than a dozen amplifier modules, we unanimously fell in love with this power amplifier and then went even further by working with the manufacturer to tailor it for our purposes. The design of the housing is purely “form follows function”. The front cover was shaped to present a full 180 degree horizontal waveform in a hemispherical pattern. We then constructed a cabinet that would yield our desired frequency response and SPL, while remaining compact for easy portability. The combination of a high quality, walnut veneer plywood cabinet with a speaker baffle and an interlocking front cover made from high density, structural foam minimizes resonances to preserve fidelity of sound. Every acoustic guitar in our boutique deserves the finest amplification systems available to recreate the beauty and detail that it has been painstakingly crafted to produce. Sound Pure’s Guitar Department has hand-selected L.R. Baggs products for their quality, innovation, and ability to create amplified sounds worthy of the world’s greatest acoustic guitars! Contact our experts to inquire about outfitting your acoustic rig with these fine products or about professional installation. L.R. Baggs has developed acoustic guitar amplification systems that capture the beauty and tonal character of even the most sophisticated instruments. Starting with the first step in the signal chain, the pickup, Baggs has perfected some of the most realistic and detailed pickup systems available. These devices employ a variety of state-of-the-art pickup designs and range from microphone systems, magnetic soundhole pickups, undersaddle pickups, bridgeplate systems, and more. Two of their most popular pickup systems, the Anthem and the M1, were recently awarded 3 Gold Medal accolades in Acoustic Guitar Magazine's Player's Choice Awards 2011; including the Anthem's award for Most Innovative New Product. Sound Pure's Acoustic Guitar experts are ready and available to help you outfit your acoustic with the perfect L.R. Baggs pickup system. L.R. Baggs is also leading the field in acoustic preamps and amplifiers to help performers craft a superior acoustic tone from start to finish. The Venue DI system was awarded a Gold Medal for Best Stand-Alone Acoustic Preamp of 2011 and has set a new industry standard for tone and control in a simple, functional package. Also new to the L.R. 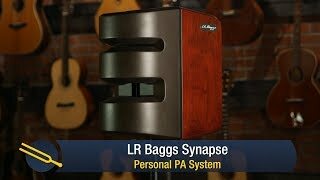 Baggs family is the incredible A-Reference Amplifier, an outstanding sound-sculpting device that you will have to see to believe!